Colemanstown Post Office closes after 130 years……. It is with a sad heart that the local Post Office in Colemanstown officially closed it’s door for the last time, yesterday, Wednesday 30th January 2019 after 130 years in business. Colemanstown Post Office was established on Monday 7th January 1889. On September 3rd 1889 Ulick Burke, Colemanstown (Frank’s grandfather) bought the business he worked in. Throughout these years our rural post office has played a pivotal role in the local community. Burkes Post Office was fortunate in that it was also attached to a shop, public house and feed store, supplying all in the local community and surrounding areas with a wide variety of much needed necessities. For those of us old enough to remember, the methods of communication were all based in the local post office…… post, telegram and the public telephone. With the advances in internet, email and new developments in financial services in the latter few years all rung great changes for Colemanstown PO, but it continued to touch the lives of people throughout the area every day, but none more so than on Fridays, pension day, when pensioners would gather to collect their pension followed by a pint or two where a good catch-up between friends and neighbours would take place. I’m sure down through the years Frank & Bernie would have seen every sort of signature from the most perfect handwriting to the most indistinguishable scrawl, from squiggle to calligraphy, from a 10second signature to a minute long signature….. In the last few years the fear must have been instilled in the pensioners when they had to attempt their first electronic signature. I’m sure great banter was created alone that day and many a story that could be told. For many years, the public phone was the only means of communication with diaspora abroad and people living away from home. You had to be there on time to make/ receive your call and hope there wouldn’t be a queue when you arrived. In those days you had to wait until the P& T operator told you to press ‘A’ to be connected and press ‘B’ to get your money back. If you got your money back you failed in your connection and just had to hope for the best and try again. How times have changed….. There has been many nights when the bar was closed that a crowd would gather in the post office for a “stamp licking session” and a bit of craic. One always knew it was a great night if you ended up in the Post Office and often many paid the price for the privilege with a sore head the following morning. Burkes Post Office, Colemanstown was operated by Frank and Bernie Burke. Frank was the Postmaster for the past 47 years, assisted by his wife Bernie. It was fitting that An Post presented Frank with a beautifully engraved plaque yesterday in recognition of his post office service for almost half a century. Burke’s family run Post Office has been at the heart of our community ‘hub’ for many a year and we are still very lucky that Frank, Bernie and family will continue to run the shop and public house and will remain open for business. For a small rural village the local shop and public house is an asset and a venue of social importance to the area. Now that the excuse of going to the post office to post a letter or collect the pension is gone can we expect sales of the Connacht Tribune to explode? We would like to take this opportunity to wish Frank and Bernie all the best on their retirement from their role with An Post and we are delighted that we will continue to see their welcoming smiles behind the shop and bar counter. Colemanstown PO has joined a long list of post offices in our environs to close recently, including Gurteen PO, Woodlawn PO & Menlough PO. It was only fitting that as a token of thanks to Frank & Bernie and the entire Burke family, Colemanstown soccer club presented an engraved token to Frank & Bernie last night to mark their last official post office day. In fact, there would be no ‘Colemanstown United’ only for their extreme generosity in donating the land for the pitch to enable the development of the club from the outset; a club which is now rapidly expanding. 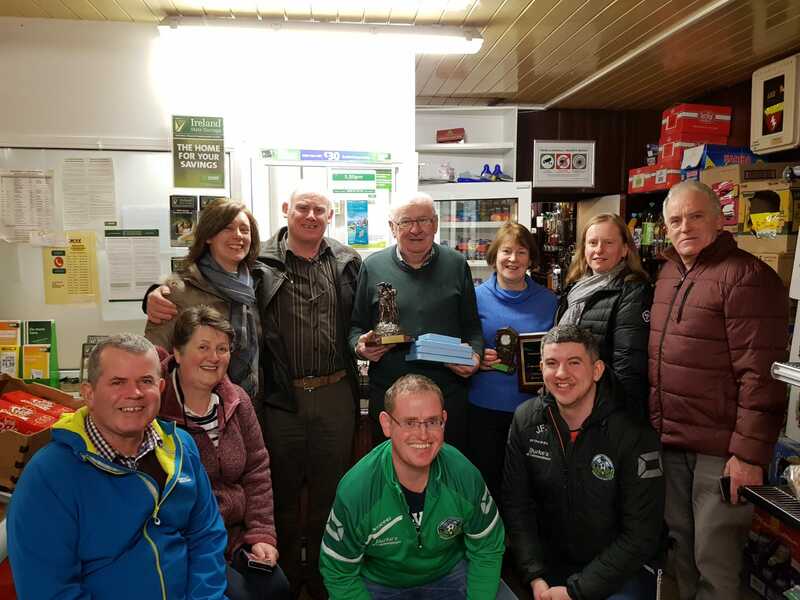 Kevin Devally, Gerry Broderick, Rosaleen Devally & Cora Clancy also presented an engraved plaque as a gesture of thanks from the Senior Citizens Committee and the community in general while Padraig Pearses Hurling club also made a presentation on behalf of the hurling club. In addition, retired Gurteen post office master & mistress organised a beautiful cake for the Burke family, fitting for the occasion. These presentations epitomise the full support so generously provided by Frank & Bernie Burke & family down through the years. We wish them well as they turn over a new chapter in their Book of Life. Best wishes to Frank & Bernie and family.